Now that autumn has arrived, the wedding fair season is fast approaching, with brides to be on a mission to make all the necessary arrangements for their big day. The wedding market is very lucrative, so it’s not surprising that there is stiff competition for couple’s attention at these events. It is therefore important that your exhibition display stands out from fellow exhibitors to gain passers-by attention. If your brand frequently changes marketing campaigns, Display Boards are a cost-effective, high impact way to present your message and enhance your brand awareness. Display boards are perfect for exhibiting photographs and wedding stationery. This is because the stationary can easily be taken off the board for closer inspection, but it’s a great, unique way to present each piece. This kind of display board system is a popular choice for companies wishing to show photographs of wedding dresses, flowers, table settings and vintage cars. Transporting your display board to and from wedding fair’s is effortless. Simply pack it away into the padded carry bag with handle and as it is incredibly lightweight, it can be carried by one person. These qualities – coupled with the easy one-person assembly – make office display boards a popular choice amongst wedding exhibitors who travel a lot and need a compact but effective display. At XL Displays, we offer a wide variety of shapes and sizes in our display board range, ensuring you will find one to suit your display needs. There are so many options when it comes to choosing your display board, including tabletop or freestanding boards. You are then able to choose the number of panels you use, the fabric colour and frame type. Our PVC Folding Display Boards are our most popular range. This includes our smaller display boards, junior and senior tabletop displays and our six, seven and eight-panel folding display boards. Our 6 Panel Display Board is our bestselling folding display board at a great price of £89.50. Pop Up Stands are the ideal marketing solution to give your brand maximum backdrop coverage. 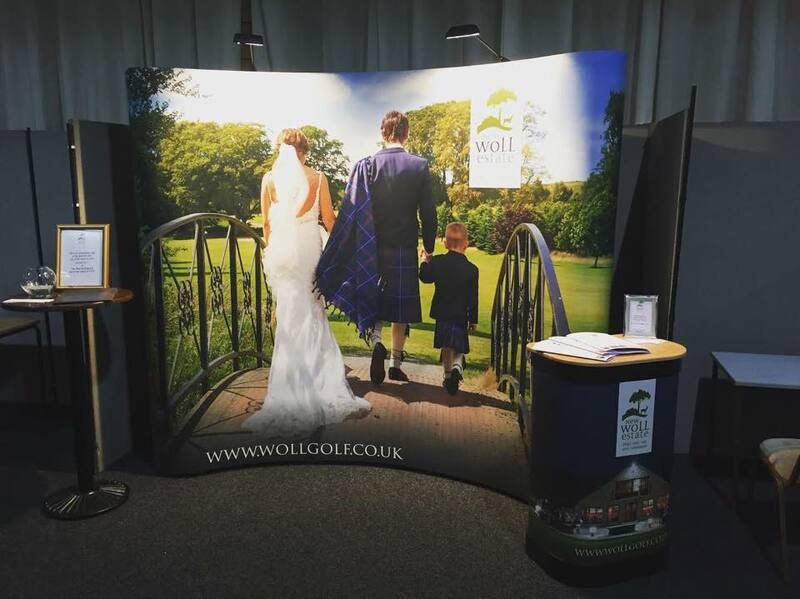 These display stands create a seamless backdrop and are therefore perfect for wedding photographers, wedding planners and anyone exhibiting at upper-class venues. 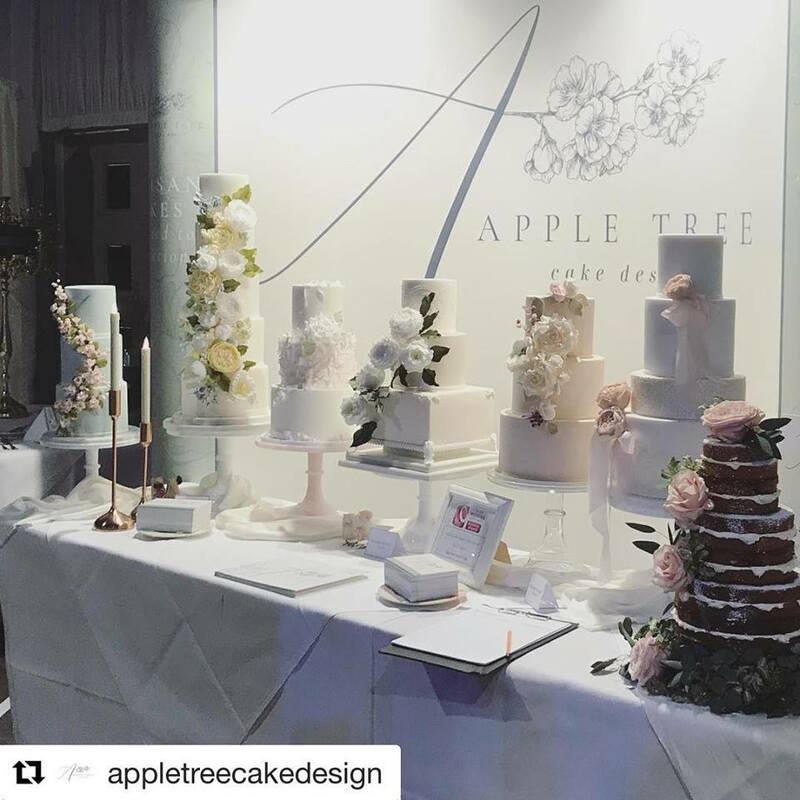 This image above from our customer, Apple Tree Cake Design, shows how a pop up stand can be used as a backdrop at wedding exhibitions. Simple branding doesn’t take anything away from the stunning cakes, but instead adds a professional branded presence. At XL Displays, we offer a wide range of sizes and styles of pop up stands; our most popular being the straight and curved configurations. However, for small display stands we also offer Midi Pop Up Stands which are 1.8m high, and for larger display areas, we also offer Jumbo Pop Up Stands at 3m high. For large scale exhibitions, we offer Linked Pop Up Stands that are ideal for exhibition backdrops and creating a panoramic printed exhibition backdrop within your show space. Linked pop up stands can grow alongside your brand through the clever use of linking panels. Pop up stands are one of the most popular exhibition solutions available on the market. They are easy to use, portable, lightweight and great value for money. All of our pop up bundles now come with free LED lights. This free of charge upgrade can save you up to 60% on your exhibition lighting costs and socket requirements at your next trade show. The state of the art LED lights utilise the latest LED die technology for superior light output, efficiency, brightness, colour rendering and economical output - giving you the best results possible whilst helping to illuminate your stunning graphics. With the option to purchase our pop up range with double-sided graphics, you have the flexibility to extend your branding from a range of angles. For those of you who are photographers or bakers, you could consider showcasing your best work on a pop up. The possibility for your graphics are quite simply endless. Pop up stands are mostly used for temporary events however, Fabric Exhibition Stands are suited to more long-term use because of their increased durability. Fabric display stands are printed using a two-phase dye-sublimation process where ink is fused into the weave of fabric using both heat and pressure. As a result of this, graphics are incredibly vivid and high definition. This allows imagery to appear incredibly fresh and vibrant compared to traditional PVC pop up displays. There is no show through or reflection on fabric displays, making them especially popular for photographers. Due to their large-scale and optional double-sided graphics, including a fabric exhibition stand to your display will allow for endless marketing and branding opportunities. Our wide range of Promotional Counters can be used for a whole host of applications, from meet and areas to displaying marketing literature and products. With our promotional counter range, you are able to add a branded graphic wrap that fits around the counter. Adding this branded element adds the final touches to your stand to make it look more uniform and professional. They also allow exhibitors to interact much more with prospective clients, while similarly working very well as a social gathering point; positioning a few counters around the stand is a much better option than simply using a table, which can be seen as a barrier when talking to potential clients. Positioning Promotional Flags outside the venue will ensure that visitors know of your presence even before they get inside. This works perfectly for wedding car hire, marquees, hen or stag organisers. Our feather, teardrop and sail flags are supplied with a choice of bases at no extra cost as standard and include a FREE carry bag. This ensures that there are no hidden costs, making your purchase simple and easy. Double-sided event flags are also available and allow you to display artwork on both sides with no show through. Our double-sided flags consist of two pieces of printed flag knit material which are expertly sewn together with a liner in the middle, this liner prevents any show through from the other side. Ideal for complementing a larger display or for enhancing your brand awareness as a lone marketing tool, tablecloths extend your branding and allow you to showcase key business materials in a modern yet impactful way. If you’re showcasing cakes, jewellery or just looking to add the finishing touches to your display, branded tablecloths are a no-brainer. Our tablecloths are a great way to add a budget-friendly marketing tool to your exhibition. For cake exhibitioners, all of our tablecloths are machine washable, ensuring that those delicious cakes won't ruin your display if they get spilled. We offer two types of tablecloths; branded and full print. Available in 19 colours and a further eight upon request, our branded tablecloths are a great way to add the finishing touches to your display through the use of a single logo. If you are looking to showcase your tablecloth a little more, our full print tablecloths offer edge to edge marketing available in a limitless colour range. When designing your graphics for your exhibition stand, think about what you want to showcase. If an image is the focus point, consider minimal text. Having too much text and imagery can look too busy and confusing. It needs to be simple with one focal point. Of course, text needs to be on your display somewhere so that people know of your branding and who you are. So, think cleverly where you place your text and the size and font you use. Having a clear contrast of colour from text to the background is an easy way to draw visitors eyes to your marketing message. The exhibition stand itself also needs to be organised in order to attract clientele. By adding a promotional counter you are creating a professional meet and greet point for visitors. This needs to be tidy so people have a clear idea on where to go when approaching your stand. For any further information or advice on exhibition stands, contact us or call our sales team on 01733 511030.